Shelby’s Halloween pictures are in! These are the ones that don’t have any identifiable faces other than hers in them. Some members of my family aren’t as big on being online as I am, and it turns out that I’m not as big on being online in all my glory as I thought I was, lol. I looked like I’d been rode hard and put up wet one too many times in the pics that were taken that night, but Shelby was beautiful as always. Here she is, ready for her close-up. I hate rats. This is a well known fact to anyone that knows me. Well, the other night we had a mouse in the house, but somehow this time I didn’t mind so much. You see, this mouse was just so darn cute, I actually found myself wanting to cuddle with it. The mouse was my four-month-old granddaughter, Shelby. 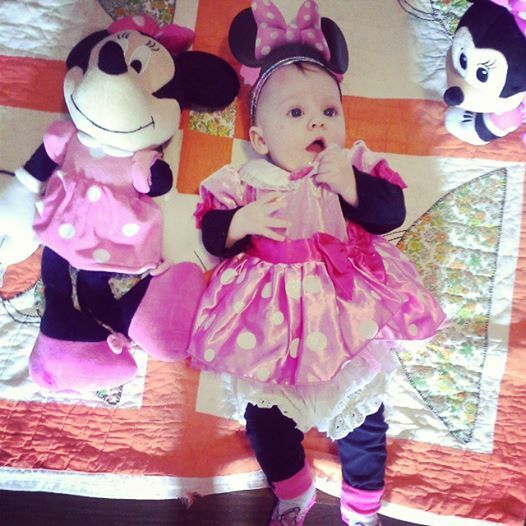 She dressed up as Minnie Mouse for her first Halloween. She’s such a dollbaby that I just have to share. Now you tell me, who is the real Minnie Mouse?